Fire protection district in Hauser, Idaho. Marc Kalbaugh holds the shadowbox given to him as a gift from the HLFPD upon retirement. Marc Kalbaugh retired from the Hauser Lake Volunteer Fire Department in 2019. In a brief speech given at the annual appreciation banquet in March, he shared what being a volunteer has meant to him. Perhaps Marc’s words will help others who are considering volunteering–not just as a firefighter but in any capacity — take the plunge and serve. The following is a transcript of Marc’s speech. I would like to thank the commissioners, past and present, for all their support throughout the years and for what they do to keep this Department moving forward and outfitted. To the members, we have had some good times but change is hard and for me I must step away. It has taken some time for me to come to this decision and it’s hard for me to make it. To the Auxiliary, some folks say you join the fire department to fight fire, I think I joined because at 3 o’clock in the morning being handed a sandwich, beef jerky, and a beverage means so much. It has been said that “unselfish and noble actions are the most radiant pages in the biography of our souls.” (~David Thomas, as quoted in Tryon Edwards, A Dictionary of Thoughts, 1891). If you’re looking for a reason to volunteer, for anything, no matter what it is, or for how long, think of the impacts you’ll have on yourself and the people you serve for and with. Years from now, my fleeting memories will be filled with the experiences that had the greatest impacts on my life. I will look back at my time in the fire service and smile knowing that my service was meaningful. It really has been my honor to serve with all of you and to serve this community. Though my time has come to an end, let’s not forget why we are here tonight: remembering and celebrating all of you for all that you do in service to this community. From the commissioners to our members’ husbands and wives, the dedication each and every one of you has to this Department, community, and the people you all help every day is truly commendable. Essentially working 24/7, 365 days a year, means sleepless nights and missed meals, taking time away from your own families and their needs to meet the needs of others. As a fellow firefighter and now as a citizen and member of this community, I would like to take this opportunity to say, thank you for what you do. It has truly been my honor, Thank You. Marc Kalbaugh served with the Hauser Lake Fire Department from 2008 to 2019. Each December, the Hauser Lake Fire Department hosts this fund raising event, in memory of Shalena, to help a local family in need. Shalena was taken by cancer but her memory lives on through this treasured community event in Hauser Lake. 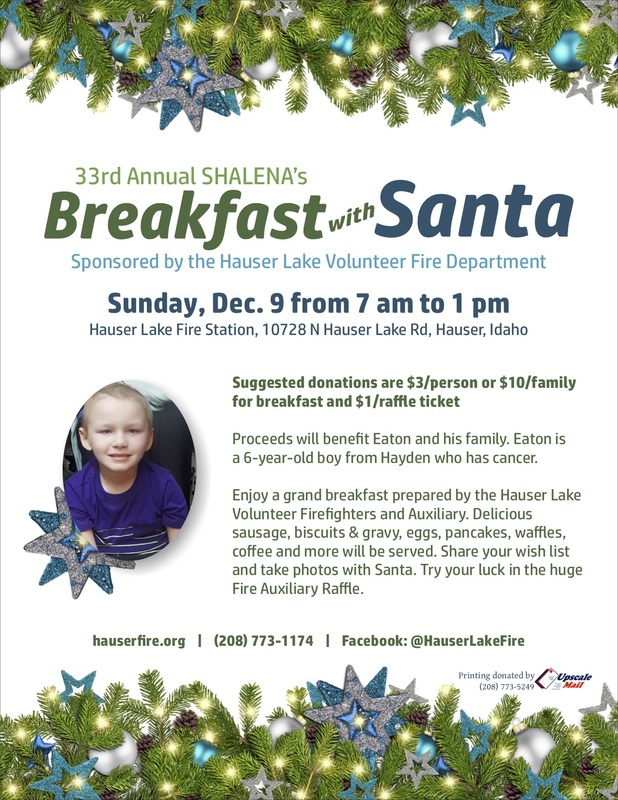 Shalena’s Breakfast with Santa is an annual fundraiser and community-building event sponsored by the Hauser Lake Volunteer Fire Department and Auxiliary. The event is held on the second Sunday of each December. Over 1,000 people are served each year; attendance increases steadily as more and more friends and neighbors discover this terrific event as a way to get into the holiday spirit. Why: Proceeds help a local family with a child who suffers from a serious, often terminal disease. When: Second Sunday in December, from 7 am to 1 pm. Prizes for the raffle, which is held each year during the Breakfast with Santa, are created, filled, and donated by the Auxiliary members and other local citizens and businesses. Special thanks go to the Auxiliary members for their valuable contributions. Share and help us even more! Please help make the event a success by promoting the event. Share the Facebook event or this web page with your friends, family, colleagues, coworkers…anyone and everyone! Each December, the Hauser Lake Fire Department hosts this fund raising event to help a local family in need. John and Betty Mobbs started the event in 1985 when they worked to raise money to help alleviate medical bills and financial distress for the family of a Hauser Lake volunteer firefighter, Gary, whose daughter was diagnosed with cancer. Shalena lost her battle but her memory lives on with the Breakfast. Shalena’s Breakfast With Santa has become an annual tradition within the community of Hauser, Idaho. With help from area businesses and North Idaho citizens, proceeds go to a family with a child diagnosed with a serous illness. The children’s illnesses are often terminal. See also the 2001 interview with Gary Mobbs about Breakfast with Santa. To suggest a family as next year’s beneficiary or for questions regarding Breakfast with Santa, email santa@hauserfire.org. Thanks to KHQ channel 6 for letting us share this fun, 2 minute video with you. KHQ Channel 6 did a little story about Breakfast with Santa on the event’s 25th anniversary. Gary Mobbs and Lisa Wendle are interviewed. Shalena’s Breakfast with Santa has been posted as an event on our social media page. Please help us help this family by sharing the 2018 flyer and Facebook event. Breakfast with Santa this year, December 2018, will benefit Eaton and his family; Eaton is a 6 year old boy from Hayden who has cancer. This year, the Fire Department’s popular annual event will be held December 9, 2018 at the Hauser Lake Fire Station from 7 am to 1 pm. Enjoy a delicious breakfast served by the firefighters and auxiliary members. Try your luck at the huge Raffle. Have your photos taken with Santa and share your wish lists with him. Enjoy a good event for a good cause and get in the mood for a season of giving! Please share this year’s flyer with your friends, family, colleagues, neighbors, complete strangers! Here are links two two different file types. Breakfast with Santa 2018 as an event on Facebook will be coming soon to this page. Please check back soon.